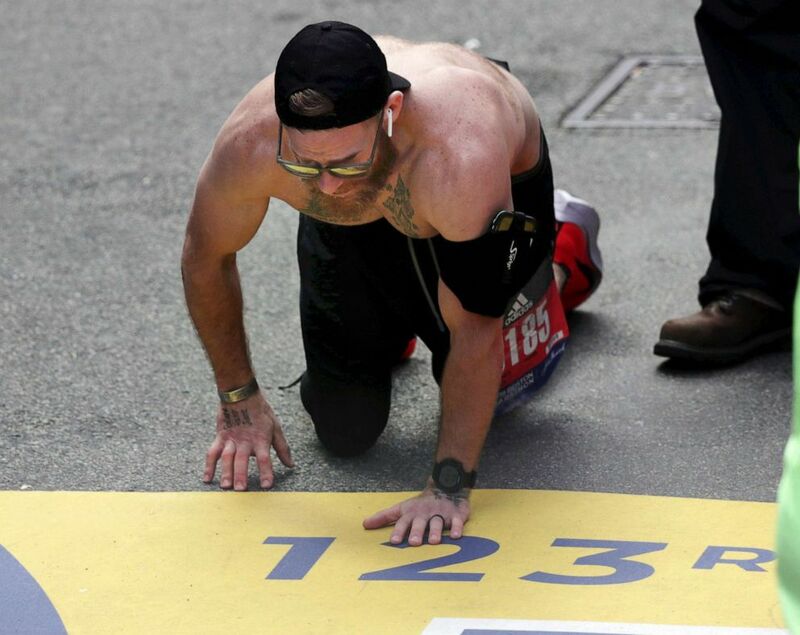 The crowd was roaring in Boston on Monday as one man made his way to the marathon finish line, inch by painful inch. "I just resorted back to the training I had throughout the Marines," Herndon told ABC News. "Adapt and overcome. If I couldn't run, the next best thing is to crawl. I started crawling for a little bit, my right hamstring tightened up, I couldn't really crawl anymore. So the next best thing is to low crawl. So I started to low crawl, waited until my right hamstring loosened up a bit, and I was able to start crawling again." Running, for me, is therapy. The 31-year-old was deployed to Iraq in 2008 and Afghanistan in 2009 as a lead machine-gunner in the "Lava Dogs" division -- the 1st Battalion, 3rd Marines, based out of Hawaii – Ohio’s Record-Courier reported in a pre-race profile. "Running, for me, is therapy," he told ABC News. Herndon suffers from post-traumatic stress disorder and survivor's guilt -- "my wounds that I wear, my battle scars that I have," he said. "One way of coping with that is running, and to honor them, because they're not here anymore and they can't run anymore. Just to honor their names and their family that's still here." Micah Herndon, of Tallmadge, Ohio, crawls to the finish line in the 123rd Boston Marathon on April 15, 2019, in Boston. Herndon is shocked by the attention his story has received since he reached the finish line, but he hopes it can raise awareness for veterans and the fact that "transitioning back into civilian world is tough," especially for combat veterans like himself. You may fall down, get backtracked, make mistakes ... but it's how you rebound from those mistakes and how you cope with them. But he also hopes he can send a message to other veterans struggling. He said that the system for taking care of veterans didn't work for him, but he found his "own release." "I just hope other veterans can know that there is light at the end of the tunnel even if you have setbacks and whatnot," Herndon said. "You may fall down, get backtracked, make mistakes -- trust me, I've made my fair share of mistakes, especially after the Marine Corps, getting back home with my friends and family -- but it's how you rebound from those mistakes and how you cope with them." Herndon clearly practices what he preaches, as his determined crawl showed, and he's not derailed by this race. He had hoped to qualify for the New York Marathon with this race, but fell short despite pacing well in the first 20 miles, finishing at a (still impressive) 3 hours and 38 minutes. After he spends some time soaking in Epsom salt and sitting in the sauna, Herndon will get back to training to qualify for Boston again next year -- and then, hopefully, get to New York.